If given a choice between two investments that gave returns as shown in table 1 and table 2, which one would you pick? If you'd made the investment represented by table 1 you'd end up with a total return of 133% over this 11 year period. A year's subscription to our hugely popular small cap recommendation service, Hidden Treasure, costs just Rs 2,950. Rs 2,950 for a year comes to just Rs 245 per month. That is an extremely small price to pay for details of high-potential small cap stocks in your inbox every month. In fact, there are some stocks you could consider investing in right now too. So hurry, click here to grab this offer before it closes! On the other hand, if you'd have picked the investment earning the returns shown in table 2, you'd end up a total return of 1,624%. This comes to a compounded annual return of 8% for the first investment and 30% for the second. Seems like a no-brainer isn't it. But yet, attracted to the stability and lack of volatility of investment 1, that's what most people end up picking. The biggest reason is that they cannot stomach the kind of declines investment 2 sees every now and then. Like in year 1, year 4 and year 11. These big falls, along with periods where the investment does nothing like in year 8, are too much to handle for the average investor. So despite the final returns being massively higher for investment 2, most investors actually pick investment 1. As you've probably guessed by now, investment 1 is your average bank fixed deposit. Consistent returns, year after year. Investment 2 on the other hand is the returns delivered over the last 11 years by my latest recommendation under Hidden Treasure - my small cap recommendation service. Now make no mistake, I've only just recommended this company and didn't 11 years back. But its return profile perfectly exemplifies the kind of returns successful small cap companies can potentially give: volatile - but well worth it in the end. In fact, this volatility is something to take advantage of. For example, if you'd have invested after the falls in year 1 and year 4, your compounded annual return would have shot up to 47% and 44% respectively. The good news? As you can see in the table, the stock has just seen an upwards of 30% fall over the last year. Need I say more? And the matrix has just spotted 4 small cap stocks which have the potential to generate solid returns over the coming few years. With over a decade of "boots-on-the-ground" experience, Richa – Editor of Hidden Treasure believes these 4 stocks could be one the best investments you could consider making to start this new year. So, before you buy any stock in 2019, learn more about this exceptional wealth-creating opportunity that is in front of you now. This company hails from the auto sector. And in case you're worried about the potential disruption from electric vehicles, you should also know that whether it is two-wheelers or four wheelers leading the EV disruption, or whether ICEs will prevail eventually, this company stands to gain from all of these outcomes. You see, the component it supplies finds application in all types of vehicles. What makes it so unique and critical for its clients are strong technical support with focus on quality, low costs, and most importantly, logistic support. The manufacturing facilities are spread across India, close to the facilities of its clients, offering it a strong edge over its peers. And like I just told you, amid the recent correction in the small cap space, the stock is down by more than 30%. Will you be the one to take advantage of this volatility? 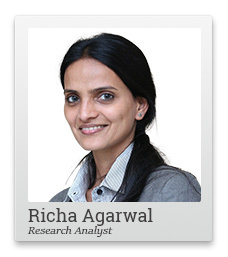 PS: Richa Agarwal has travelled across the country to discover the small caps that grow up to become tomorrow's blue chips. Her services are exceptionally popular - and since 2008 have beat the markets nearly 3X. Grab your subscription now to start your own wealth building journey. Equitymaster requests your view! Post a comment on "This Is Why You're Not Making Big Money In The Markets". Click here!